All the tools are also available in the Dutch language (Nederlands) now. 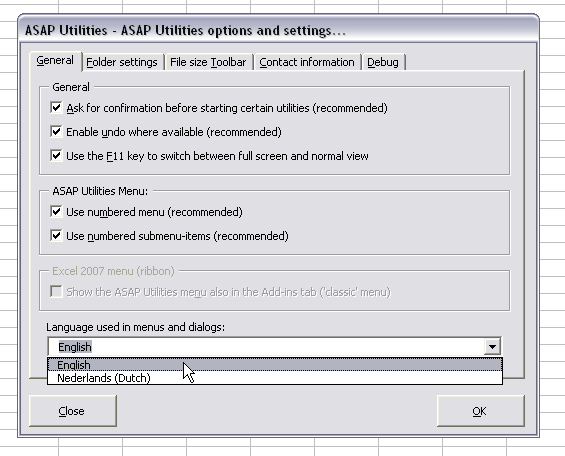 If you have the Dutch language of Excel, ASAP Utilities will now start in Dutch, otherwise it will start in English. Note: Only ASAP Utilities itself is translated at this moment. The setup is still in English and so is our website. �Do you want to disable all the toolbars? This can be a useful alternative for Excel's "full screen" option. You free up up screen space and in contrary to the "full screen" option the formula- and statusbar are still being showed. Has been redesigned and now also contains the option to restart the count after a certain number. The utility will now also count better when cells are merged (the merged area will now be counted as 1). The form has been slightly redesigned. 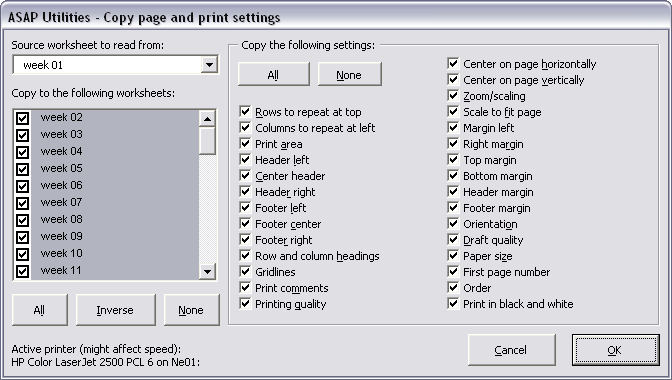 Information is added that your printer-driver might affect the speed of the tool. The "Launch" submenu has been renamed to "Start". We have done this because in Windows, "Start" is the name of the place where you start your programs too. 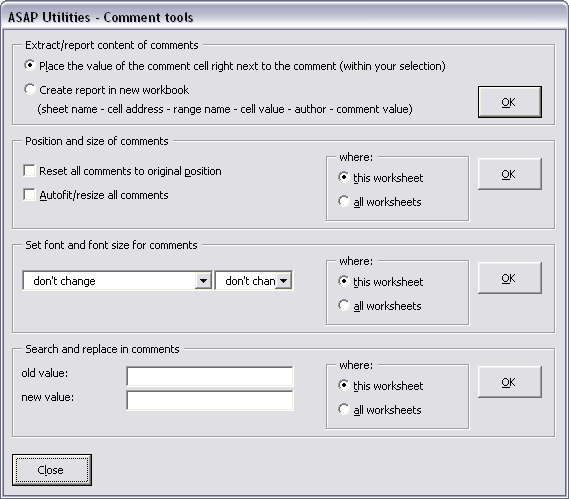 If you have Excel 2007 this utility will now also report the name comments. 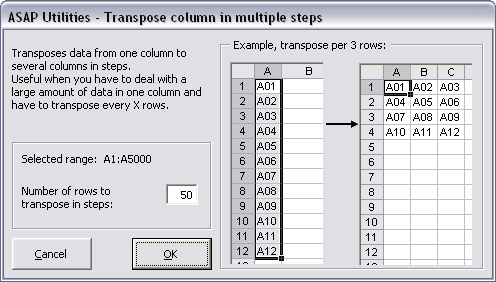 This utility was case sensitive, meaning that for example "Excel" and "EXCEL" were different values. You can now specify if you want the comparison when looking for duplicated values to be case sensitive or not. By default the utility is now no longer case sensitive. 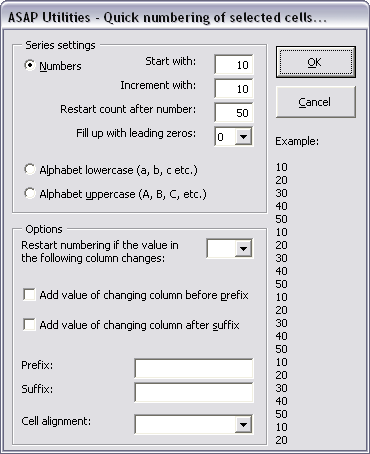 When searching for duplicate or unique values, this utility was case sensitive, meaning that for example "Excel" and "EXCEL" were different values. You can now specify if you want the comparison when looking for duplicated values to be case sensitive or not. By default the utility is now no longer case sensitive. 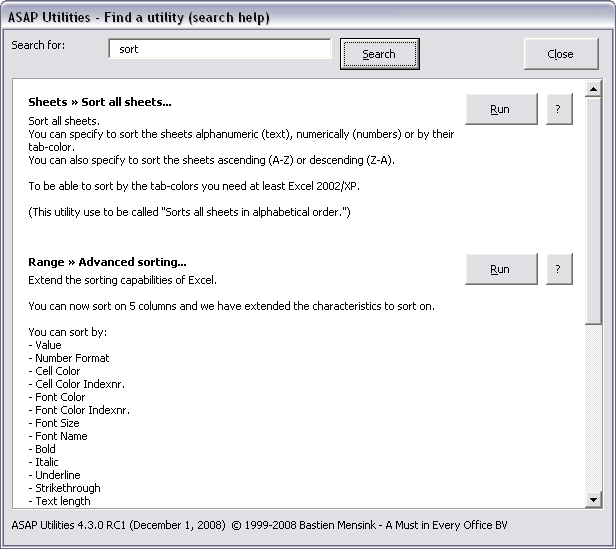 When searching for duplicate or unique values, this utility was case sensitive, meaning that for example "Excel" and "EXCEL" were different values. By default the utility is now no longer case sensitive. When searching for text, you can now specify too if the comparison should be case sensitive. 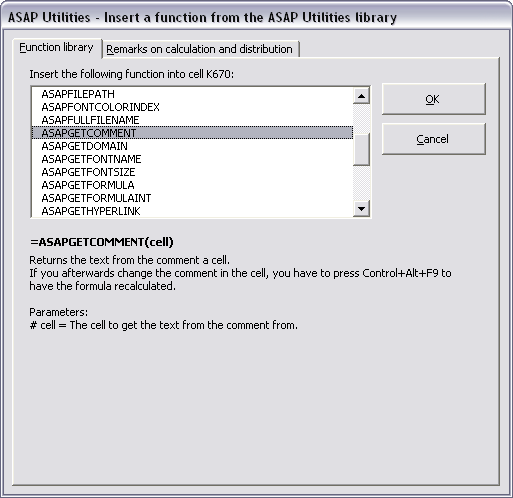 This utility has been added to help you insert a formula from the ASAP Utilities functions library. In case of problems you can now activate the debug mode by creating an (empty) file in the ASAP Utilities program folder and name it 'debug.txt' (without the quotes). In your windows temp folder you will then see a file called 'asap-utilities-debug.txt' which contains information that might help us in solving certain issues. 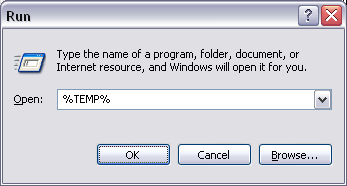 You can quickly open the temp folder in Windows explorer by choosing "Run" in the Windows Start menu and then entering '%TEMP%' (without the quotes). Improved speed when hiding or removing the results. 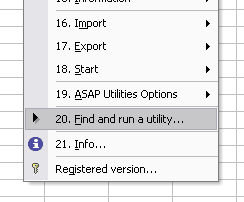 Has been renamed to "Find and run a utility..."
Main menu: "User Guide (pdf)" has been replaced with "Find and run a utility..."
The "Find and run a tool..." is more powerful and therefore located in the main menu now. With this utility you can search for a tool, view the description and immediately press the "run" button. 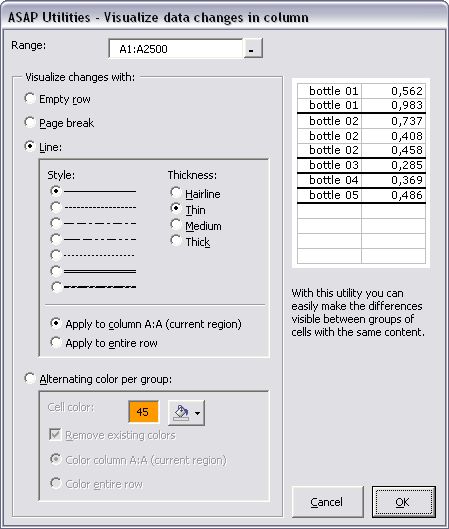 The order in which the tools are displayed is changed so that the range sorting tools are showed together. Furthermore the "Count and/or color duplicates in selection..." utility from the "Information" submenu is now in the "Range" submenu too, right below the utility "Clear duplicated values in selection (leave one original)". You now have to option to only count the unique values within the visible cells in your selection. This can be useful for example if you are working with filtered lists. 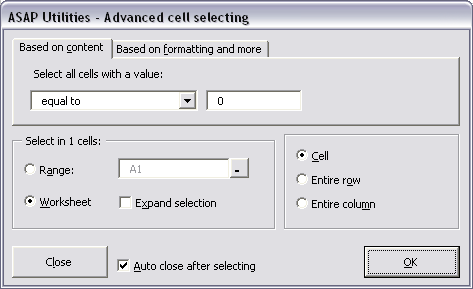 Instead of only selecting the first found cell with the smallest number this tool will now select all cells with the minimum value within your range or on your worksheet. 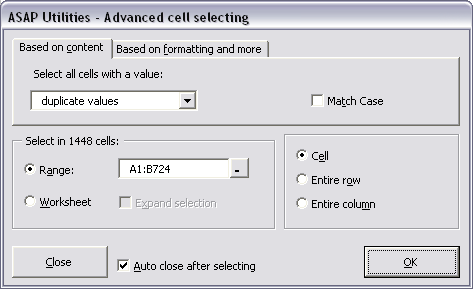 Instead of only selecting the first found cell with the largest number this tool will now select all cells with the maximum value within your range or on your worksheet. 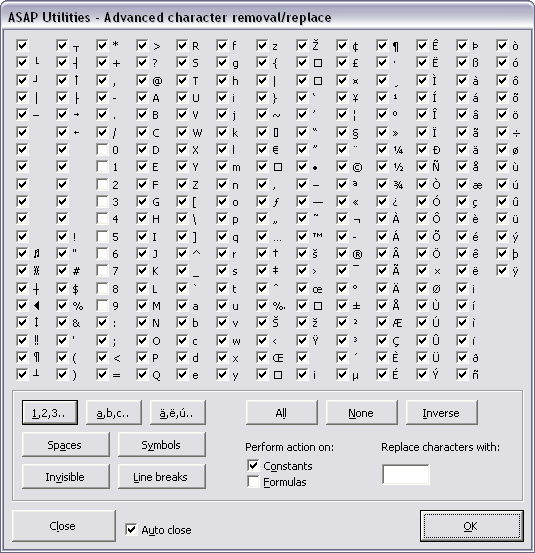 The following characters have been added: ý, ů, ě, ā, ē, ī, ū, ę, ą, ÿ, and ű. This utility will no also decode named html entities such as €. 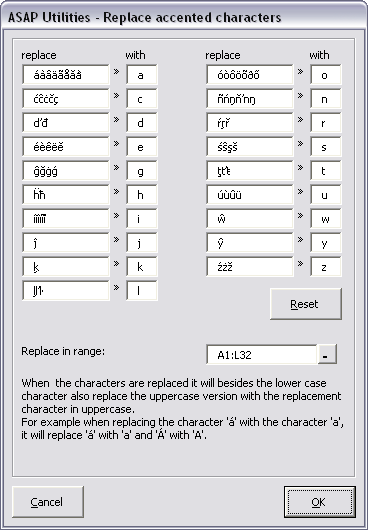 Furthermore it will decode entities such as %c3%84 and %c3%a7 and it will decode unicode characters such as © and �. New option: Cell character encoding, Characters such as < > & and Unicode characters will be converted to their html entities so that they are properly displayed in a browser. The < NOBR>option has been replaced by nowrap because < NOBR>is not approved by the World Wide Web Consortium (W3C). Instead of encoding the cell's value with < NOBR></ NOBR>the utility now adds 'style="white-space: nowrap"' within the < TD>tag. Instead of working only on a single worksheet this utility now removes all manually set pages breaks from your selected worksheets. 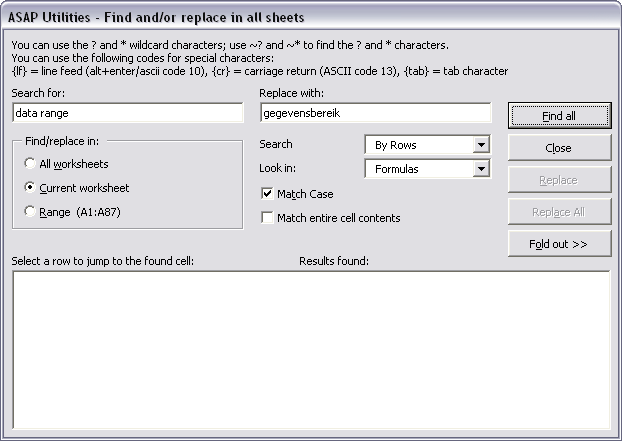 In Excel you can only remove all page breaks one sheet at a time by first selecting all cells and then choosing "Reset All Page Breaks" in the "Insert" menu. 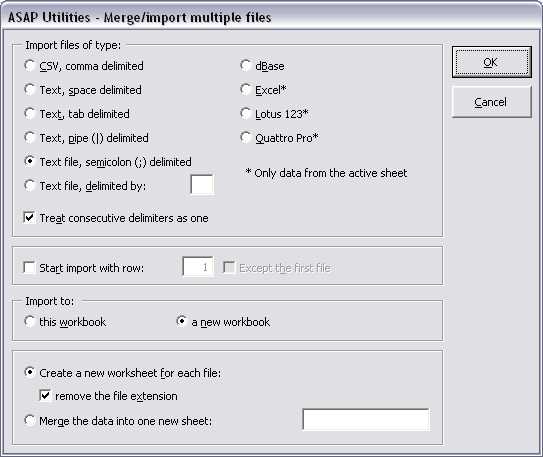 With this utility you can now easily remove the page breaks on multiple sheets at once and you don't need to select all cells upfront. 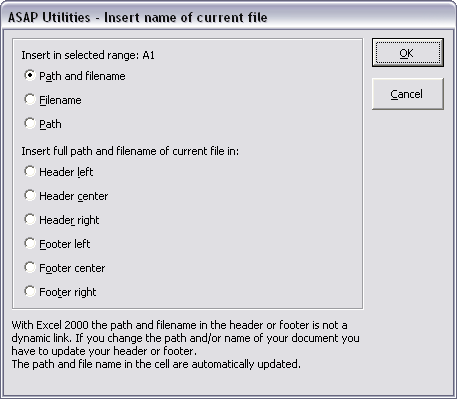 The utility now also extract the subaddresses in the link (the part after the #) and the utility also extracts the link from cells with the =HYPERLINK() function. This function now also extracts the link from cells with the =HYPERLINK() function. Improved progress indicator and refreshing the screen when you switched to other applications during lengthy operations. 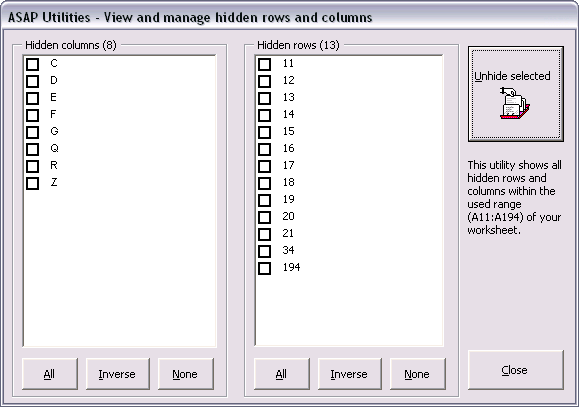 This tool previously also removed the drop-down arrows in cell validation lists. This is now fixed. When you import Excel files the column width is now preserved. The file types option was case sensitive. This now no longer is. So it doesn't matter if you search for *.xls or *.XLS for example. If you imported a file with the extension CSV, your custom settings were ignored, and the file was always split by your Windows list separator. This is now fixed. When the option "skip empty cells" was set this was ignored by the program. This is now fixed. Fixed the error Method '~' of object '~' failed. This could happen if you started Excel and then immediately imported a file without any editing of the blank workbook Excel started with. Excel then just opened the file and closed the blank workbook which caused the error in ASAP Utilities. If the Excel menu bar was protected (a very rare situation) you could get an error stating that the ASAP Utilities menu could not be created: "Sorry, I can't create the menu due to an error... Method '~' of object '~' failed." This is now fixed. We have created a workaround for this by temporarily removing the protection, creating the menu and then applying the original protection settings again. 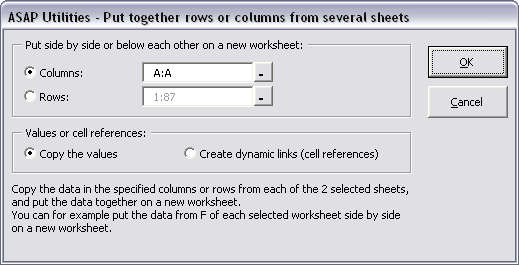 Fixed the error when you used the utility in Excel 2007 on a workbook that was opened in compatibility mode and it had only 255 columns instead of 16384. 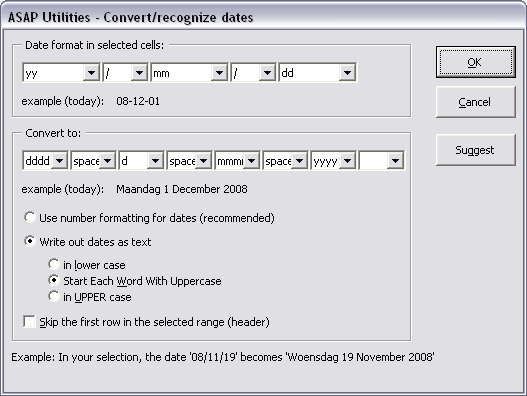 If you used the utility on a range that contained a cell with a date you got an error. This is now fixed by skipping all cells with a date. 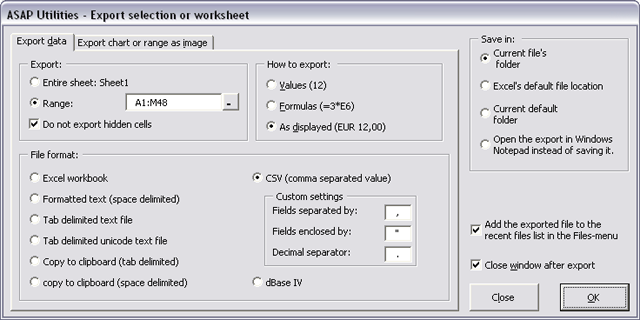 The utility produced an error if you workbook contained a hidden sheet that had the visible property set to xlVeryHidden: "Move method of Worksheet class failed". This is because a xlVeryHidden sheet can not be moved. Therefore this utility now skips the sheets that are hidden like that. 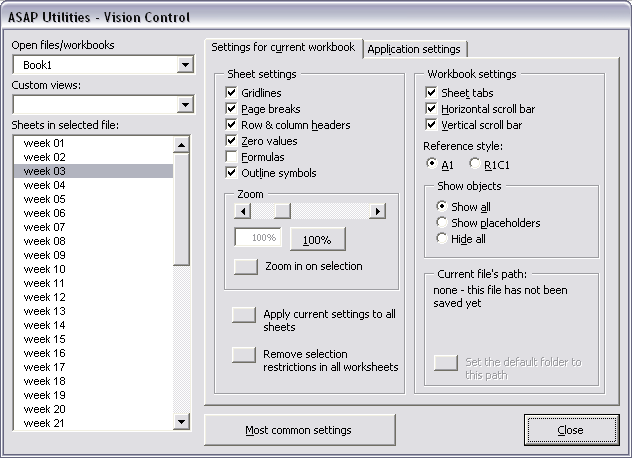 Didn't work and gave an error when one or more sheets in your workbook were hidden. This is now fixed. Gave an error if the formatting of the cells was protected. This is now fixed. The utility also gave an error on cells with very long text, this is fixed too. The utility didn't work and gave an error on cells with very long text values. This is now fixed. The =HYPERLINK() option does not work if the length of the address exceeds 255 characters. This would result in an error. 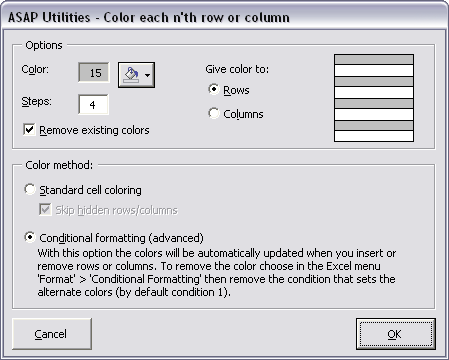 ASAP Utilities will now warn you upfront if any of the cells is too long to use the formula option. The =HYPERLINK() option does not work if the length of the address exceeds 255 characters. This would result in an error. ASAP Utilities will now skip cells that are too long and inform you at the end how many cells were skipped because the address was too long. Once you filled up the numbers with leading zeros the utility didn't always work when you ran the utility on the same data again and wanted less leading zeros. This is now fixed. Improved, especially on cells with very long values (more than 1024 characters). Several improvements and small bugs fixed. This utility has been removed from the menu. 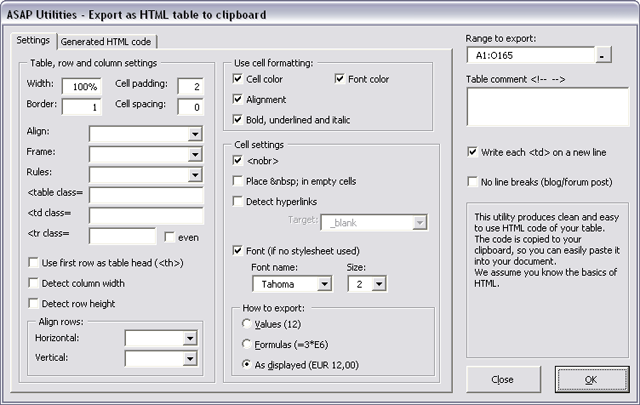 The tool hasn't been updated for years and we don't think that anybody will miss it, also because newer Excel versions have built in schemes for quickly formatting a table.